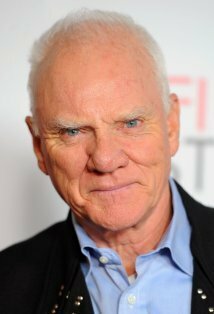 The younger generation probably knows Malcolm McDowell from his villainous roles in the last 10 years – Star Trek, Heroes, Superman and Rob Zombie’s Halloween. A handful might know he was in the freaky classic, A Clockwork Orange. But before all that, McDowell was the it-boy of English film, starring in Cannes Palme d’Or winners and charming the pants of his audience. In Never Apologize, a tribute to director and dear friend Lindsay Anderson, McDowell relays stories of that experience in such a fashion that you feel as though you’d run into him at a pub. he stands, in mostly black, on a mostly dark stage with just a table set for two) and a podium with a small reading lamp. His simple tales are those of Richard Harris, Sir John Gielgud, Sir Lawrence Olivier, Bette davis, Lillian Gish, and John Ford. Yet they were not the tabloid fodder gossip about people we’ll never meet. Instead, McDowell, through recollections, letters and diaries, convinces us they are our friends. They are humanized, real. They are funny and tragic. And a reminder of the importance of the influence, and importance, of friends in our lives. An afternoon’s luncheon with the royalty of English theatre in the 60s & 70s is a lightly sketched Shakespearean scene — a misunderstanding among gods. A description of Lillian Gish is starkly contrasted with the riotous Bette Davis — who is exactly what we’d all expect. And a dying John Ford’s brief conversation is only a prologue to the loss of Anderson himself. McDowell deftly pulls us in. He reads and speaks with simultaneous vigor and tenderness. It says as much about McDowell as it does about Anderson.